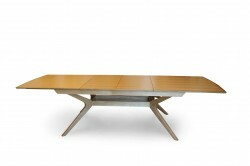 We make a vast array of Dining Tables, please browse a selection below. We will custom make for you. We are proud to display some testimonials from our happy clients. "Yes, I love the table and coffee table. The table is simply gorgeous and exceeded all my expectations. I am so grateful you understood and interpreted everything I asked for, to the minutest detail. Worth every penny! My husband is also thrilled. Your team are a credit to you... I told them this. You craft tables that will last hundreds of years. 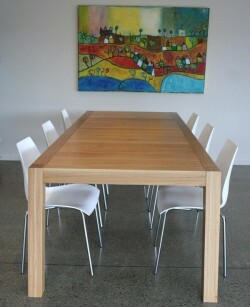 And what is even better, is that this gorgeous piece of furniture is made right here in NZ. Definitely something we can all be proud of. I never want to part with it... I love it, love it, love it! Thanks again Dave. Give yourself a pat on the back." 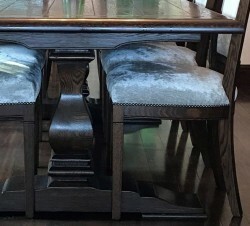 "Just a quick email to say thank you very much for the beautiful job you have done on our dining table and also for the exceptional customer service. 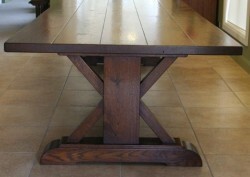 We are thrilled with the way the table has come up – it is like having a new table once again! We have really appreciated you offering to resurface the table for us free of charge – it proves the importance and value in supporting New Zealand businesses such as yours. Once again, my sincere thanks go to you and your team. With kind regards and best wishes "
" This is just to say a huge thanks for our new furniture. The 'made over' bedrooms look really awesome and both of us have spent time sitting in either room and just looking at what has appeared. Both rooms look great. Friends who have been this weekend have been mightily impressed. Many many thanks"
"Bookcases in and they look fantastic – had a couple of issues putting in the shelves, then realised that you had numbered them for us – so all is well. You have done a wonderful job of the cabinets – they are amazing and enormous! But they look great and I am very happy with them – they make the room look totally different. Now just got to convince my husband that we need a new dining table!" "Wonderful. They look beautiful! Many thanks. By the way, from someone who has been in retail & PR, you should know that the service from your company today has been a breath of fresh air. Thank you for being so attentive and so prompt. No wonder you have such a good name....sadly I am just discovering you." " Hi Dave the furniture has arrived and it is GORGEOUS!!!!! Thank you so much! Thank you again Dave .. A wonderful and beautiful job"
"Thanks Dave, furniture arrived this afternoon and it is fantastic, we love it." "The furniture is just beautiful- thank you so much." "We're very happy with our beautiful new table and seat." "Have just received the dining setting and I'm thrilled to bits - it looks fabulous!" "Just thought I'd let you know the pieces all look as though they've been there forever – it's great." "The Delivery Company has today delivered our beautiful display cabinet - thank you. We will be in contact again as I have my eye on another piece of your furniture!" " Our dining suite arrived yesterday afternoon, We love it"
"Our lovely hall table has arrived safely today. Thankyou for your craftsmanship a great service. The fun starts now as we start to build a story around it... It's been a really positive and relaxed process working with your team. 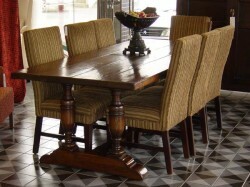 Many thanks"
We have extensive experience in making one off pieces of furniture.